Please take a closer look at what we have to offer. Jezioro Czorsztyńskie (the Czorsztyńskie Lake) is surrounded by the Pieniny National Park, being one of the greatest tourist attractions of the region. The lake, with a coastline of nearly 30 kilometres (19 mi), was created by the construction of a water dam on the Dunajec river in Niedzica. Today, it offers a variety of water sports to choose from, such as: swimming, diving, sailing and fishing. 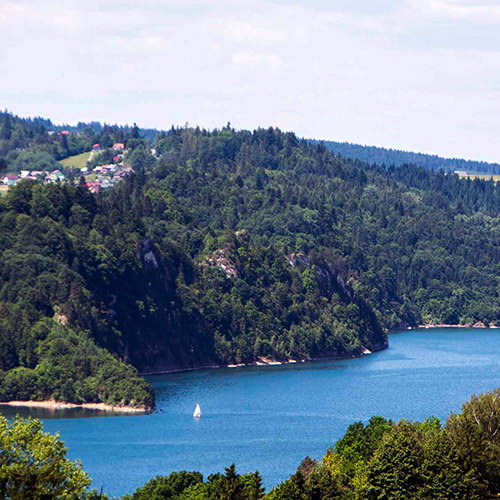 Silhouettes of two medieval castles are overlooking the lake – in Czorsztyn and in Niedzica. 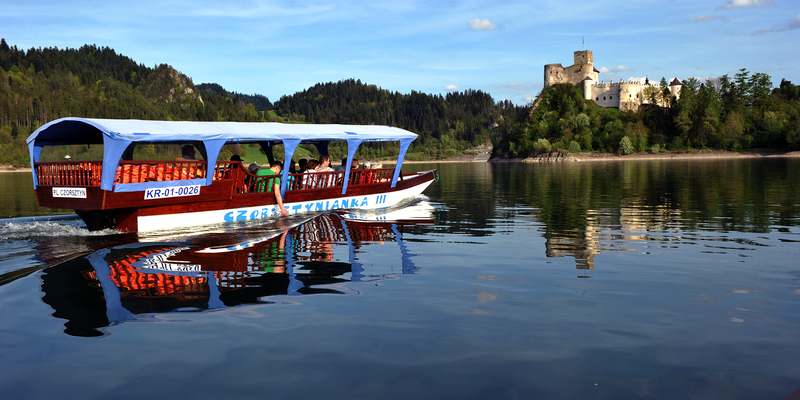 – The cruise starts regularly every 15 minutes from Czorsztyn or Niedzica. – This is just a perfect way to freely stroll along both shores of Jezioro Czorsztyńskie. – The cruise starts with a minimum of 8 passengers and takes approx. 40 minutes. – This is an ideal opportunity to enjoy the finest bays and beaches of the lake. Our gondolas “Czorsztynianki” sail daily from the 1st of May till the 30th of September: 9 a.m. – 6 p.m. during high season and 9 a.m. – 4 p.m. off-season. Our fleet of 6 gondolas can take up to 72 people at a time. Gondolas can easily carry bicycles, skateboards etc. and pets are more than welcome. After the cruise we invite you to our marina. Przystań Jędruś (Jędruś Marina) in Czorsztyn provides a range of activities to do, while spending time at the magical Jezioro Czorsztyńskie. In addition to gondola rides you can also rent kayaks, water bikes and fishing boats. For the kids, we have prepared a wonderful playground with the only giant pirate ship in the region – an inflatable slide. A second swimming pool for children up to 12 years of age is equipped with a waterslide. Apart from the slides, the young ones can have fun in water walking balls or on a trampoline. The gondola passengers enjoy a free of charge entrance to the playground. At the marina you will find a food booth, where you can purchase cold and warm drinks, snacks, ice cream and sweets. After all the sightseeing, fun and food our guests can relax in the adjoining garden with benches sheltered by umbrellas, on comfy beach chairs around the entire marina or hammocks in a shaded grove. the shores of Jezioro Czorsztyńskie! 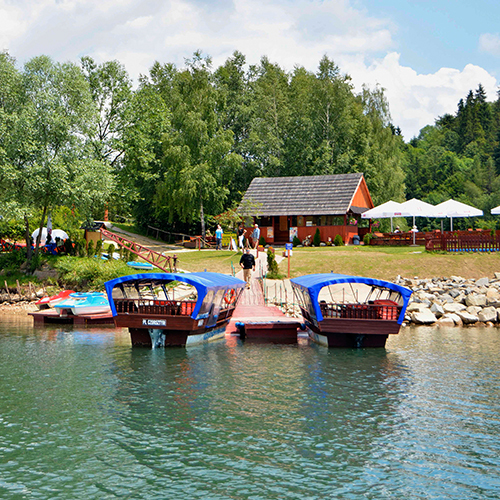 Want to find out more about our cruises, the marina or the playground in Czorsztyn? Check out our full gallery. On the map you will find our exact location. Use the form to book a cruise or make an enquiry.